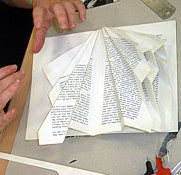 I recently did a book sculpture class with Guy Begbie who is an internationally recognised book artist. It was great to learn some new skills and techniques. Here is a photo of my work in progress.